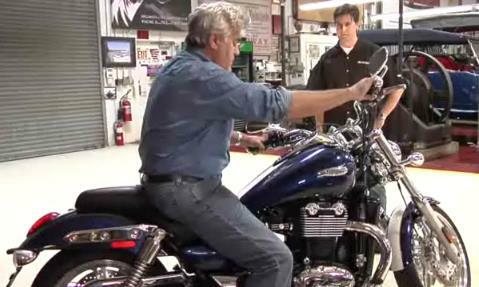 American talk show host and celebrated petrol-head Jay Leno has added a Triumph Thunderbird to his 17,000 square foot garage. The Thunderbird is just the latest addition to a huge private collection that includes a Ducati Desmosedici RR, a Vincent Black Shadow, a Y2K Turbine Superbike and a classic 1953 Triumph Thunderbird. Watch the video for a walk-through of the new Thunderbird and a glimpse of the other Triumphs in Leno's collection.